• Regions of the dopamine-rich reward system, including the ventral tegmental area (VTA), dorsal striatum, and basal ganglia—areas that, interestingly, are implicated in early-stage passionate love. This "pleasure center," lead researcher Lucy Brown explains, "helps us recognize when something feels good." • Regions implicated in maternal attachment, including: globus pallidus (GP), substantia nigra (SN), Raphe nucleus, thalamus, and insula. 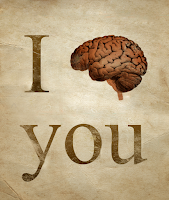 Co-author Arthur Aron notes, "Intense passionate love uses the same system in the brain that gets activated when a person is addicted to drugs." Adds Brown, "You can feel happy in love, but you can also feel anxious. The other person becomes a goal in life." A craving, an obsession. A feel-good sensation. Sounds like drug-taking behavior to me! Love is perhaps one of the strongest of the human emotions, and we have long-known that animals' brains are wired to choose a mate, perhaps going to extremes for attention and affection. Whether you sparkle like Edward Cullen or prefer the John Cusack boombox approach, do whatever it takes to let yourself be known. They'll be addicted before you know it! And if you don't have a significant other, chocolate is a perfectly appropriate and chemically-similar substitute. Indulge, and Happy Valentine' Day! 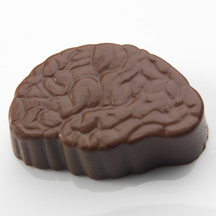 Chocolate brains from VisualAnatomy.com; $8.65 for a box of 4. Anatomically correct, scientifically accurate, and delicious (perhaps not nutritious)! Images courtesy HuggleMistress (DeviantArt) and Visual Anatomy.